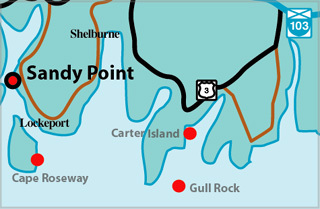 For local tourist information, go to Sandy Point Lighthouse Community Centre . This attractive lighthouse, which originally was built on a pier, now sits on a crib at the east side of the entrance to Shelburne Harbour. At low tide the tapered wooden tower is accessible across a sand bar. There is a sandy beach, swimming, birding, and a community hall where snacks may be available. 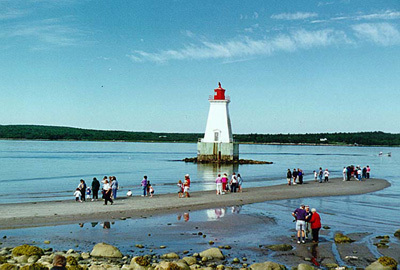 Many festivals and activities take place here in summer, especially lobster dinners. Light Height: 047ft feet above water level.